Watch this short video showing many Peak District attractions. Very popular with tourists, this attractive market town on the river Wye, is famous for its Bakewell Pudding. The Bakewell Arts Festival is held every summer. Something for all the family. Grand and historic house, gardens, water cascade, park, activity play area, shop, restaurants and farmshop. Enjoy regency grandeur at the Opera House or visit the Pavilion Gardens. Buxton attracts visitors all year round and especially for the Gilbert and Sullivan Festival in the summer. Rainy day ... then think of visiting a cave. Pooles Cavern, Buxton and the famous Blue John Cavern near Castleton are open to the public. Famous theme park - the thrill of the rides (Nemesis pictured above) plus fun activities for all the family. A tree top adventure - high wires, zip wires, ladders, tunnels, walkways, crossings and bridges. At Buxton and Cannock Chase in the National Forest. There are many outlet centres in the Peak District, such as Denby Visitor Centre (above), Peak Village at Rowsley (nr Matlock), Masson Mills (Matlock Bath). Melbourne (above), Shugborough, Tissington, Haddon and Renishaw Halls are privately owned and open to the public. Many interesting sites of past industrial significance including Cromford Mill, Silk Museums on the Derwent, steam train rides at Peak Rail, the Potteries at Stoke, Mining and Brewing Museums. National Trust properties include Hardwick Hall, Calke Abbey, Kedleston Hall and Sudbury Hall with its museum of childhood (above) and Visitor Centres at Ilam and Edale. Parwich is typical of very many interesting and scenic Derbyshire Dales & Peak District villages - Hathersage, Eyam, Winston, Tideswell, Hartington to mention but a few. 15 mins from Ashbourne is Carsington Water, a centre for water sports - Sailing, Windsurfing, Powerboating, Kayaking & Raft Building. Family fun at Gulliver's Kingdom, a more sedate ride at Heights of Abraham plus Derbyshire Craft Centre, Matlock Farm Park and Crich Tramway Village. Go to Derby or Nottingham for their nightlife - theatre, cinema, music, bars and clubs. Look out for special open air productions in the summer. Award winning, indoor and outdoor, attraction at the heart of the National Forest. 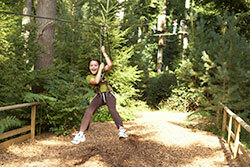 Enchanted Forest Adventure Play area, a simulated Tree Top Walk, Fairy Labyrinth and Adventure Activity Days. A more complete list of attractions can be seen on the Visit Peak District website.